Imagine an alternate reality where Joshua Abraham Norton never moved to San Francisco, never lost his mind and fortune in the rice trade, never appointed himself the Emperor of the United States and Protector of Mexico. What if, instead of writing proclamations about bridges, he wrote lesson plans about them instead? How would the infrastructure and history of this alternate San FranciSCHOOL diverge from our own? These are some of the questions posed in Emperor Norton’s Mail-In Engineering Academy – an immersive box truck environment by Kasey Smith. Part engineering lesson plan, part team building exercise, and part history lesson – Emperor Norton’s Mail-In Engineering Academy made it’s debut in conjunction with SFMOMA’s On The Go Family Programming and Sunday Streets on Sunday March 8th 2015 and will be appearing as part of Everyhere Logistics in the summer of 2015. 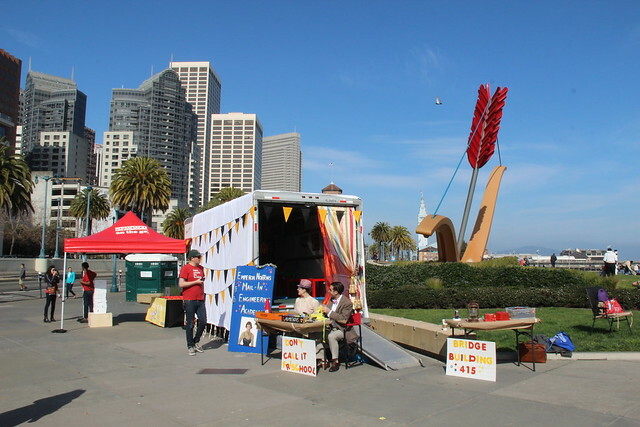 The project was designed along three interrelated interaction points – two outside the box truck and one within – meant to appeal to different age groups and modes of interacting. These interaction points were The Admissions Office, Remedial Ed, and Bridge Engineering 415. What kind of screening questions would a fly-by-night, unaccredited engineering school ask? And what kind of financial aid would they provide? 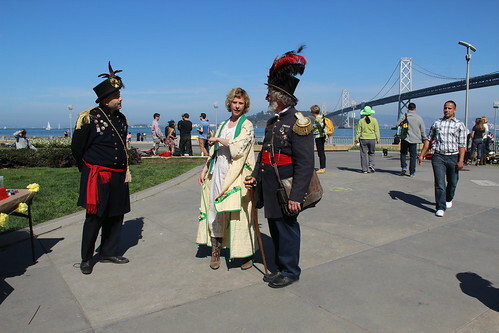 The purpose of this interaction point was to introduce people to the concept of the piece and the historical figure of Emperor Norton. 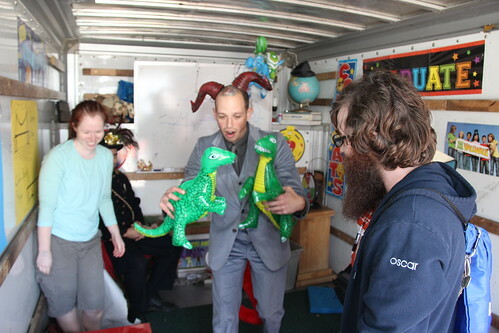 Secondary purposes were to pass out Norton dollars and sort out people too young or pressed for time to go through the full box truck experience. 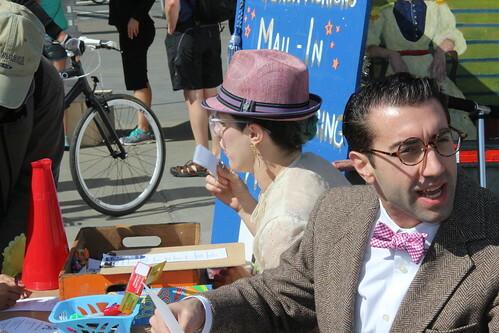 Dressed as pompous professorial types, the Admissions Officers sat at the entrance of the truck and asked applicants about their Edumakational Level, their experience building sand castles, and the interest rates on Norton Dollar student loans. Sixty one adults and older children filled out our full application form; the full results of which can be seen here. How do you engage with small children, families with bicycles, and people too pressed for time to engage in the full box truck experience? The purpose of this interaction point was to add value for the youngest participants who found the Emperor or Bridge Troll too scary to interact with (there were tears; not many, but some). The secondary purpose was to entertain people with bikes or pressing schedules who couldn’t come in the truck for Bridge Engineering 415. 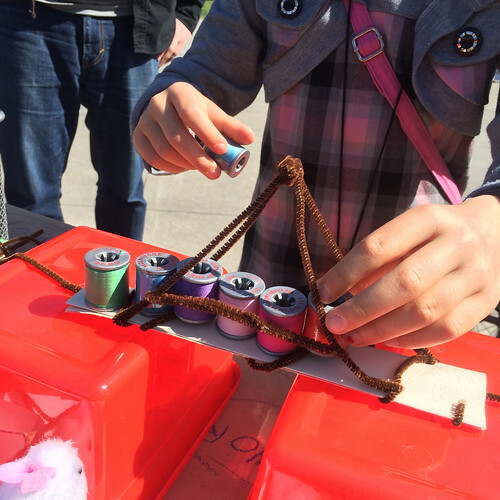 Dressed as school teachers (and headed up by Sally Smith, a retired school teacher), we made simple paper and pipe cleaner bridges and tested them by piling them full of pennies, army men, plastic sea creatures, thread spools, and other assorted knick knacks. With chalk and crayons we also drew pics of bridges and kept “score” on who could fit the most pennies on their bridge. What Would Emperor Norton Destroy? This was the heart of the project and the main interaction point. 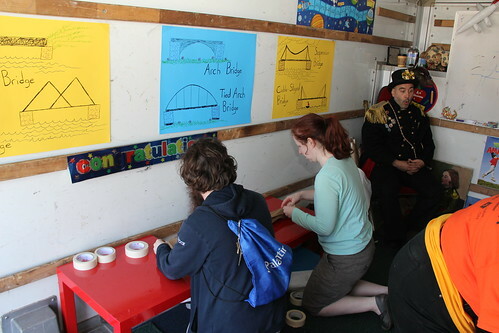 Designed as a humorous take on an old elementary school lesson plan, we divided participants into two teams and under the tutelage of Emperor Norton and this three TAs, had them construct suspension bridges using butcher paper, packing tape, and pipe cleaners. Once complete, the Bridge Troll would spin the Wheel Of Destruction to determine whether bridges would be tested against Hurricanes, Dinosaur Attacks, Pony Stampedes, Sharknados, Snakes on a Plane, or Space Asteroids. Kasey Smith, Mark Krawczuk, Joshu A. deLeon, Chris Ory, Tess Aquarium, Colin Fahrion, Ian Dawson, Sally Smith, Christian Davies, Aaron Teixeira, Starchy Grant, Aleris Duggan, Matthew Gallaer, Jacob Fenwick, and Danielle Gellis.